August 2004 to-date Associate professor in medicine, section of Haematology and Oncology, Faculty of Medicine, College of Health Sciences, University of Nairobi. • 1997 – to – August 2004 – Senior lecturer in Medicine, section of Haematologyand Oncology, Faculty of Medicine, College of Health Sciences, University of Nairobi, Nairobi, Kenya. • 1991 – 1992 – Honorary senior registrar in the Department of Medical Oncology at the Royal London Hospital, London, UK. • 1987 – to – Date – Specialist services in Haematology and Oncology at the Kenyatta National Hospital, Nairobi, Kenya. • 1986 – 1987 – Provincial physician, North Eastern Provincial General Hospital, Garissa, Kenya. • 1983 – 1986 – Senior house officer in medicine at Kenyatta National Hospital, Nairobi, Kenya. • 1982 – 1983 – Medical officer in-charge, Nyamira District Hospital, Kenya. • 1980 – 1982 – General duty medical officer, Homa Bay District, Kenya. • 1979 – 1980 – Medical officer-intern, Nyanza Provincial General Hospital, Kisumu, Kenya. • 1987 – 1997 - Lecturer in Medicine, section of Haematology/Oncology, Faculty of Medicine, College of Health Sciences, University of Nairobi, Nairobi, Kenya. • 1997 – 2004 – Senior lecturer in Medicine, section of Haematology/Oncology, Faculty of Medicine, College of Health Sciences, University of Nairobi, Nairobi, Kenya. • August 2004 to February 2014- Associate professor in medicine, section of Haematology and Oncology, Faculty of Medicine, College of Health Sciences, University of Nairobi. 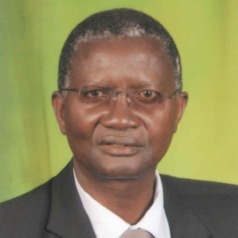 20-02-14 to-date-Professor of medicine, section of Haematology and Oncology, Faculty of Medicine, College of Health Sciences, University of Nairobi.